I cantered with my herd through the snowy storm through the dark forest, struggling to keep up. We were in search of fresh water, and i had no idea how all the other horses could keep it up. My name is Rose. 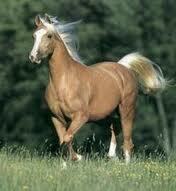 I am a mare of the Oceania Herd traveling to Hidden lake and waterfalls with the Dahlia herd. I am on the island of Sesshamaru, inhabited by many wild horses and a few ranches here and there. It was dark and just after twilight. It was raining heavily and the herd was large and fast, i was a slower type dawdling at the back. Soon i lost them. I was alone and tired in a dark, wet rainy forest. How could things get any worse? As i walked through the dark forest for another hour, i exited it and found a circle of tents, a pole with three horses tied to it and three tents. I walked up to one of them and sniffed it. What were they? What was inside? Soon to my luck the rain died off. I pushed gently on the front o the tent. Something from inside the peculiar tent moved! I whinnied softly and stuck my nose through the gap. The zipper opened and i heard a small shriek. I whinnied and backed up in fright. The zipper fully opened and a little girl poked her head out. I whinnied. She screamed. Another tent zip opened, and a woman came out. She rushed over. The third opened and a man came out. There was a lot of talking going on i could not understand. I stood back in fright. The man pulled something from his pocket and started talking into it. The little girl had gone back into the tent and her mother had joined her. I cantered tiredly into the forest, and stopped in an area where the trees weren't so thick and lay down. Soon i fell asleep. I wonder where my herd is now, i thought as i drifted away. The next morning, i saw a few men mounted on horses. I jumped to my feet, staring at them wearily. Oh my gosh i am so sorry its so short! next one will be longer, i promise!! I could smell a sharp perfume coming from inside the tent. It was white with some weir smelling windows on it and was pegged tightly into the ground. It didn't seem to mean any harm at all. The zipper fully opened and a young girl, maybe seven or eight years old sleepily looked out. I whinnied lightly and backed away. She screamed. Another tent zip opened, and a woman came out. She rushed over. The third opened and a man came out. There was a lot of talking going on I could not understand. I stood back in fright. The next morning, I saw a few men mounted on horses. I jumped to my feet, staring at them wearily. The scent of cracked leather and different horses filled the crisp, fresh morning air. One of the horses came up, in complete control of it's rider. I sniffed the man sitting on the horse and he looped a rope over my head and tied it in a halter formation. I shied backwards in fright. He pulled the left-over rope and I edged forward. I will do more soon, I have got homework! I reluctantly followed them with my ears laid back. We passed through the silvery, thick forest for a few minutes until we reached the edge. They sped up to a fast canter, but I stubbornly followed them at an uneasy trot. I didn't like them at all. After a short while, we arrived at a big ranch. There was a large bar, acres and acres of bright green meadows with fresh sweet selling grass enclosed by gleaming white, strong fences. Nearby that was a big indoor arena and an outdoor one. Beside that was a large wall neatly stacked with soiled hay and on the other side under a shiny silver metal roof. On the side of the barn was a small room filled with saddles, boxes, pitchforks and grooming equipment off all sorts. The air was filled with the smell of saddle leather, horses and grass. Despite all this, I did NOT want to stay. I preferred living free, with my herd, not cooped up here having these people sticking stuff on me and being on my back. If its short, I am sorry. I have lots of time but i cant tell whether it is long enough or not. Comments appreciated!